This Converter Electronic Circuit Project a very simple build 12-16V-Converter. Many devices operate from a car`s 12-V electrical system. Some require 12 V; others require some lesser voltage. An automobile battery`s output can vary from 12 to 13.8 V under normal circumstances. The load requirements of the device might vary. This circuit maintains a constant voltage regardless of how those factors change. 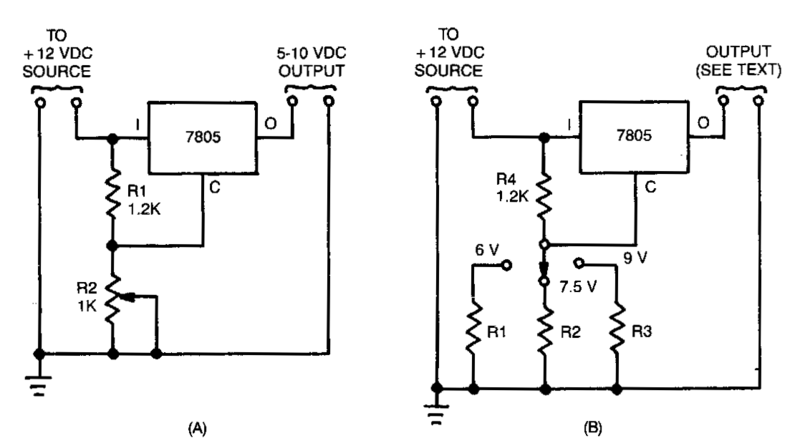 Simple circuit, A, uses a 7805 voltage regulator. In addition to a constant output, this JC provides overload and short-circuit protection. That unit is a 5-V, 1-A regulator, but when placed in circuit B, it can provide other voltages as well. When the arm of potentiometer R1 is moved toward ground, the output varies from 5 to about 10 V.